UPPER EAST SIDE — She was lucky to avoid arrest. 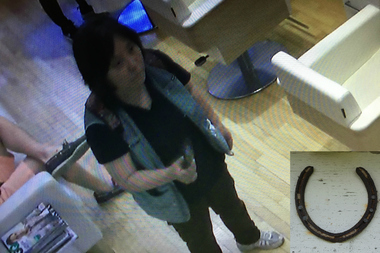 “Who walks inside a shop in 2015, takes photos with a flip phone and steals a horseshoe?" said Renat Zarbailov, the owner of Quality Barbers at 164 E. 88th St. The woman, whose identity is unknown, walked into the shop at about 4 p.m. on Monday and started taking photos of a painting displayed which depicts a portrait of Meryl Streep wearing cotton candy for hair, Zarbailov said. Surveillance footage from inside the store then shows the woman leaving the shop and returning a few minutes later to take more pictures, this time of the barbers and their clients, which is when employees asked her to leave, said Ibrahim Redzovic, a barber who was working at the time. "The clients weren’t too pleased with her taking photos so at one point I told her 'We're working here, there’s no time for a photo shoot, that’s enough, this is a private place, please leave,'" Redzovic said. She complied, but on her way out she snatched a metal horseshoe from the doorway, which was kept there for good luck, Zarbailov, 38, said. Redzovic, 37, is then seen in the video running out of the store to go after the woman. The culprit was standing outside the shop when Redzovic caught up to her, he said. Redzovic demanded she return the item and when she obliged, he let her walk away, he said. "She wasn't happy about it," he said. "She gave me a mean look." Zarbailov filed a police report with the 19th Precinct regarding the incident the following day, police confirmed. The horseshoe isn't worth much, but it was a gift from a friend in Zarbailov's home country of Azerbaijan, said Zarbailov, who owns the barbershop with his brother. "It's like an old tradition that people believe in — the horseshoe brings luck," he said.